There are no fruit trees on this property, but there are two trees behind us, planted just against the fence and hanging over it, which to our delight turned out to be an apple tree and a pear tree. We left two kinds of apple (yellow transparent and red Gravenstein), Italian plum, and apricot trees at our old house. We knew we would miss them. It was a happy surprise last year to find that we had apples growing in the big tree on the street side, on what was at that point a vacant property. I glanced up into the branches one day as I went out back, went closer to peer up into the tree, and came in to report apples forming. As we monitored that tree and watered it over the fence (after all, we were going to get the fruit) we wondered what kind of apple it was. There are so many varieties. I decided that it was probably either a yellow or green type, but I didn’t know for sure; all we could do was water and watch. Then one day the light struck the branches just right, and I was stunned. I waited several days until I was sure, then drew my husband outside. The tree was a yellow transparent, of all the apples in the world. We had to add that to our list of blessings, things Heavenly Father knew when He brought us exactly here. Yellow transparent trees came from Russia, and they withstand cold winters. 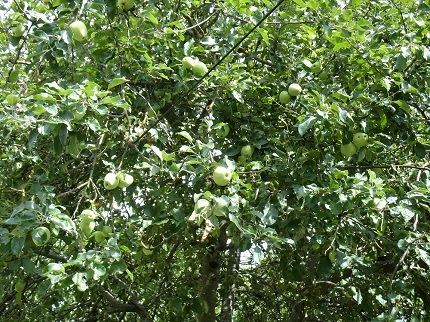 Here the apples are still a little green, but starting to drop on the ground. The tree was loaded this year. This is a week before picking. Yellow transparents are an old time cooking apple. They’re tart and very soft. You might — might — find some someplace at a farmer’s market or an orchard’s own stand, but they aren’t grown commercially because they don’t hold up to shipping. You can find the trees to buy if you search. They are my husband’s very favorite apple. He isn’t actually a big apple person, but his family had a transparent tree when he was growing up, and he loves them. They’re not just his favorite taste, but his memories of his mother’s cooking and canning. They’re distinctive. If you let them ripen completely, they become almost white; if you let them ripen to that perfect state, they will go from ripe to ruined very quickly because the insides will start turning brown. They’re soft and bruise easily, but they have a wonderful flavor. They also come on early in the season. I remember the year that a friend in our ward called; her daughter and son-in-law had moved into their first home, and she was pregnant and not feeling well. There were apple trees, and one of them needed to be picked but she was not up to doing much with them. It was a yellow transparent — would we be interested? That was an instant yes. We went over and cleared out as many as we thought we could deal with, and came home and started cutting. One batch started to turn pink in its jars as it waited in the canner rack for the next kettleful to cook down and be ready. It was a little odd and a little lovely as they turned rosy; when they were done, each pint in that batch was a slightly different color, according to how long it had sat, hot, waiting to be processed in the boiling water bath. That tree had been planted, pruned, and shaped by a master gardener, and it was a revelation to pick larger, lovelier apples than I had ever seen. They fixed up quickly because there were few imperfections. I’m afraid our own tree had not been as well cared for as this one, and it made a difference. But our tree was in an off year, and we were thrilled to have these apples, no matter what their condition might have been. This tree behind us now is big, at least fifteen feet tall. I have no idea when it was planted, but it has to be decades old, and it hasn’t been really taken care of since who knows when. I have neither the capability in body or tools, nor the right of ownership, to do anything with it, except permission to pick. The city truck came through last year and trimmed the branches where the power lines go through, but that’s it. So when the apples were falling to the ground, I called a family in the ward with kids who love an excuse to climb trees, and a mother who is willing to bring them. The apples might have been best with a few more days, but on the other hand they were coming down spontaneously as windfalls. It was the brief weekend window between the son coming back from scout camp and his two sisters going off to girls’ camp, and I was just glad we could work this out at all. With another week’s delay I think we would have lost a lot of them. They couldn’t reach everything. The girls scurried up the tree and we braced the ladder and passed up an old skinny rake that I had found in the basement, so that they could grab a branch with it and shake where they couldn’t climb. The apples that fell onto the sidewalk bruised on impact, but the ones that fell into the grass on that side or the garden on my side weren’t damaged as much. We used what means we could. I had been picking up and picking over the windfalls every day, and there was a basket of salvageable fruit already. We added a couple of cardboard boxes, sorted and pitched the bad stuff into the yard waste bin, and the totals accumulated. The mom was going to girls’ camp herself, and I wanted them to have some apples for their time and help, so I put together the best ones. Because they were going to have to wait a week in the cool of a basement, I didn’t want any bruises. I asked the oldest daughter Sunday if her mother had been able to make use of the apples, and she said that mostly they just ate them. I told her I was glad they enjoyed them, and thanked her again for the help. We couldn’t save all the fruit. It fell before our picking day, some of it was still a little green when we got it down, and bruises turned to rot before I got to them. It was imperfect, messy, and wearing at times as we slogged through the process of washing, cutting out bad spots, coring, cooking, and bottling. In other words, it was a normal earth-life thing. It wasn’t without effort, error, or fatigue. The tree itself hasn’t had the care of that young couple’s trees. I lost some fruit because I couldn’t work on it one of the days I had planned to due to circumstances beyond my control. I can’t do the long stretches of cutting and canning that I could do when I was younger, either. Some of the apples that looked all right on first inspection went bad because we hadn’t spotted damage. Some shortfalls are inevitable, whatever our endeavor. When we see boxes of fruit at the market or farm stand, all that messy stuff that’s part of the process of harvest and preparation has already been done by someone else. It’s all sorted, weighed, and transported, just ready to go. But it didn’t happen by magic — someone did the work, and culled the damaged ones. Remember that, next time you feel like your life or self is a wreck, and the people you see around you seem to have it all together. You just aren’t looking at the imperfect messes or the losses that went before. They happened, guaranteed. I got about thirty pints of applesauce, not counting what I sent home with our helpers. That’s a pretty good yield for a tree that would have simply gone to waste. It’s been hot, and I’ve run out of useable apples before I was quite done just having some to cook and eat. I’m a little sad about that; I haven’t quite had my fill. 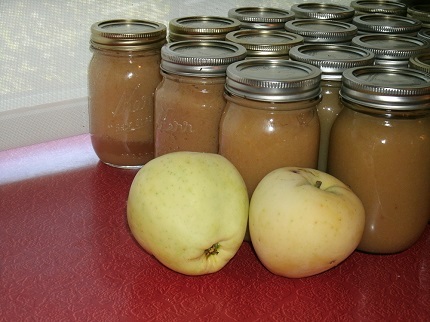 The last couple of apples and some of the 30 pints of applesauce, the fruits of our labor. When we bring up a jar from the basement, nobody is going to grill us on our percentages or wag a finger and tell us we didn’t do well enough to deserve eating this fruit. No one is going to ask if we had an acceptable yield or if we did a perfect job at saving every piece that fell. Instead, they will say how delicious it is, and how much better than store-bought. We accomplished what was needed. Our Father in Heaven gives us the chance in this life to taste of the fruit of His love for us and the promises of Christ’s atonement. The tree that was pristine, the tree here whose apples needed to be carved out both brought the same result from doing the work that was necessary: good fruit preserved for the day of need. Our imperfect lives are always seeking and struggling to find the best ways and pare out the blots and bruises. That’s how earth life is. The love and help of God heals all our sins and imperfections, and holds out to us that most desirable and delicious fruit of all, His joy.